Forts and dens are lots of fun to make, and with the weather starting to perk up and the summer holidays round the corner, there’s no better time to get the kids together to start their clubhouse design plans. Go on, get the colouring pens out and get them to put their ideas onto paper. We share our most imaginative tips to help make sure you build the ultimate woodland den. Make nature work to your advantage and look for trees with low reaching branches, bushes that are grouped together or logs that could make good side walls. Look for somewhere that offers a bit of privacy and secrecy perhaps – building a fort in the middle of an open field won’t give you much cover. Avoid anywhere that’s likely to get muddy and try to pick somewhere that gets a lot of sunlight. Spend some time gathering old branches to use. Look out for larger, strong branches that can be used for support posts, and look for branches with plenty of leaves that can help to cover up gaps. Blankets, shower curtains or sheets can be used to make things comfortable. Cardboard boxes, tarpaulins or even old furniture like wooden tables or chairs turned upside-down can be used to make separate rooms or areas inside the den. Umbrellas can work very well to make a roof nice and waterproof. Make sure everyone has their own jobs to help. First put the main supporting posts/branches into the ground – you might need a taller person for this. Join them up in the middle and bind together with twine, wire or duct tape. A central, taller post can be used in the middle to create a sloped ceiling. Use leafy branches, cardboard or plastic sheets for the roof. For a cool twist, make a drawbridge door/entrance out of cardboard and rope, or a secret escape route out the back in-case of any possible enemy intruders. Home comforts are super important in any good clubhouse. Cushions and blankets can help make it cosy, and you can decorate the walls with daisy chains, leaves, outdoor fairy lights and woven reeds. Bunting or wind charms can be hooked over the branches, and you can hang a flag from the very highest branch at the top of the roof to show it’s your club house. Dig a small hole into the ground to keep bottles of water and boxes of sandwiches cool. Use pebbles to line a pathway outside to your woodland den to help your club members find their way. 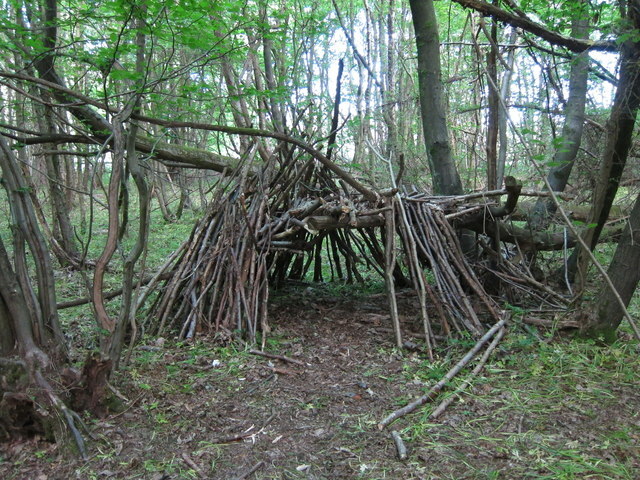 The most important thing is to make your woodland den fun. Turn it into an armoury with nerf guns, water pistols or bows and arrows. Water balloon catapults can add extra defenses to your fort. For star gazing or cloud spotting, you can include a sky window in the roof which can be easily covered up when not in use or when it’s raining. Extra keen astrologers might want to place a telescope underneath. For water play, make waterfalls using bottles or pipes. Hide messages in plastic bottles kept in the gaps of the walls, or keep walkie-talkies so you can send signals to your fellow club members. For animal lovers, bug hotels and bird feeders can be hung on the outside walls. Buckets, cups and old wooden spoons can be kept for making mud pies or fairy potions.